Welcome to the Bottom Ten. But, first, a political ad (17 seconds). Lane Kiffin has still not been forgiven for leaving the head coaching job at Tennessee after 14 months to take the same position at USC. Kiffin is, in fact, so reviled in the Volunteer State that he's in a political attack ad there (see above). Eddie Smith, a candidate for the Tennessee House of Reps, has charged that opponent Gloria Johnson, the incumbent, has "made a lot of big promises...like Lane Kiffin" and is "all talk" like Kiffin, now an assistant at Alabama, where he is no talk (coach Nick Saban does not allow his minions to speak to the press). Now back to your regularly scheduled Bottom Ten. For the eighth straight week, the No. 1 team was dethroned. The most recent leaders to tumble were the Texas Short Horns and the Michigan Woe-verines. In a controversial move, the selectors re-admitted Miami (Oh!) to No. 1 despite a 42-41 victory over Ole Mass on their record. Of course, Miami (1-7) does lead the nation in defeats. North Carolina (3-4) moved up to No. 2 amid indications its won-lost record may be altered. The New York Times reported an investigation found that that more than 3,100 UNC students, 47.6% of them athletes, received As and Bs in nonexistent classes. UNC, according to one report, is expected to forfeit every victory in every sport over the last 117 years, except, possibly, one 1968 debate squad match. Note from Andy Furillo, Bottom Ten's Sacramento bureau chief: "Looking forward to Saturday's Big "Ten" traditional between Nebraska and Rutgers." Still another guest Bottom Ten selector popped up_sidelined Arizona defensive end Darnell Dockett, who taunted Raiders fans with a sign that said: "Worst Team in NFL...0-6" (see above). 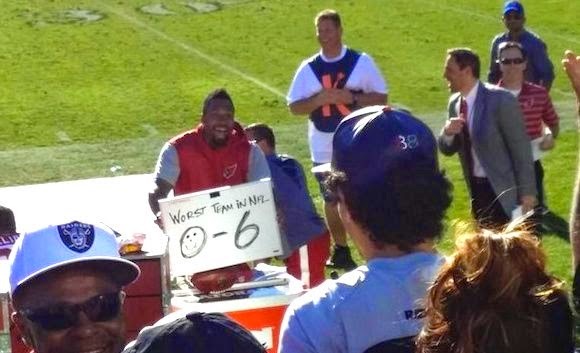 Hey, no hard feelings---Dockett drew a smiley face inside the 0. As Dockett forecast, the Raiders lost and were elevated to No. 1. But Oakland might still get a fight from the 1-6 New Jersey Jets, who fell to New England, 25-27. The Jets did so by extending one of the most beloved streaks in the NFL. For the 69th straight game, they failed to make a 2-point conversion, most notably at the end of the game when they could have sent it into overtime. 6. Jacksonville (1-6); 7. Minnehahha (2-5); 8. Washington (2-5); 9. N.J. Giants (3-4); 10. The Chicago Bears locker room, starring Brandon Marshall.